I’ve been thinking about how to write this one up. Because, when you achieve something spectacular, it needs a build up! 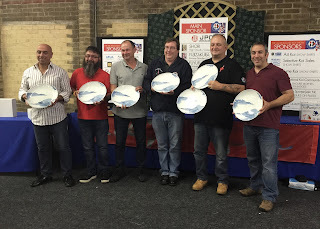 If I jumped in straight off and said I’d won the Baby Champion award at what is currently the most prestigious UK koi show, winning the award out of 82 koi … I’d be missing out all the build up. The news is, that although I’ve had a few days to reflect on our achievement last weekend… I am still taking it in. The baby champ was a bit camera shy at the show... and the pictures I have of it are rather limited. Here's a range that show off some of it's best features. 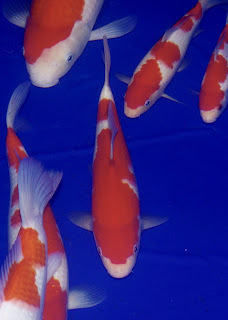 4 years ago, I started planning a koi breeding project. The first breeding season was 2013. With the experience gained in that summer, I reset my targets and laid out a 10 year plan. 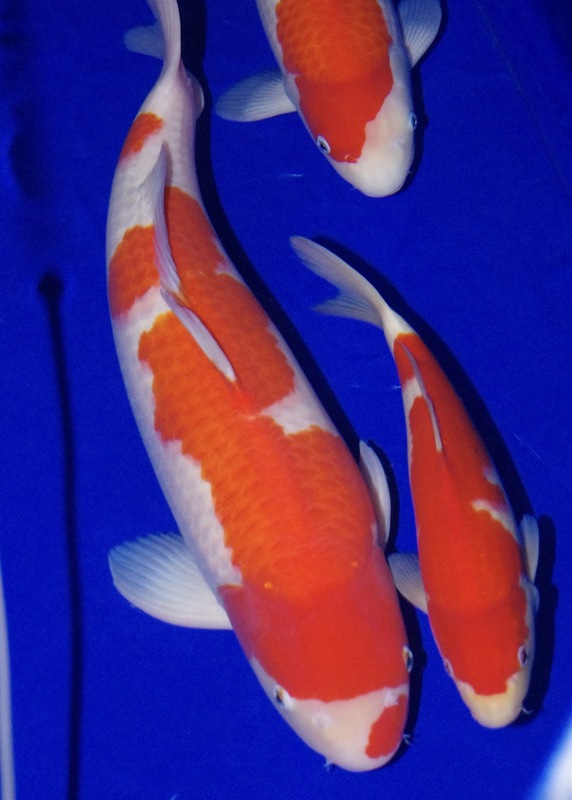 The first 5 years to learn how to breed and rear koi and find a good parent set – and hope for some occasional wins in the show scene; then in years 5 to 10 to be winning competitive show prizes regularly. In 2015, I won baby champion awards at a medium sized open show (South of England show), and my club’s garden show. I also won young champion at my club’s garden show. This year, ie year 4 – I have won baby champion again at that same medium sized open show (South of England show), and have as of last weekend won the baby champion award at what is basically the largest and most prestigious show in the UK – the All England Show. 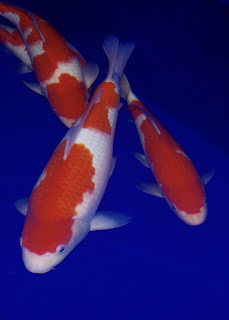 Each award won with a different koi. Winning the baby champion at the South of England show this year was a big step forward. A double, having won it also the year before. It shows consistency. Plus, the competition was particularly tough this year. But last weekends baby champ award at the All England is on another level. I can’t better that in the UK. And frankly, I thought breeding koi at home to that level would be a stretch. Turns out, it’s possible. There is the BKKS national show too – which in the past has been the one to win; but it faded away for a few years, and is currently making a come back. It might be one to look at again next year. However, the All England has been ever present and lets put it this way – in 2016, the Grand Champion at the BKKS National – a fantastic fish – was knocked back to a 3rd in overall size award, such was the level of competition at the All England show this year. The practical aspects of winning at the All England is really cool; I am now on the list of winners that records every winner of a major prize at the show for 30 years. 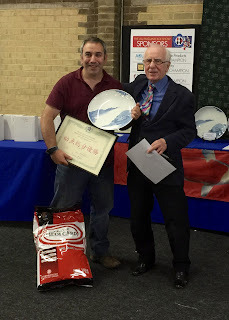 And, I get to keep my trophy – the coveted ‘plate’. Even my non-koi friends and family have cottoned onto this being a little more than a geeky hobby achievement ! In terms of records – it’s been a first for me, and also for the All England show too. I’ve checked with Bernie Woollands from the South East club – whilst there have been some successes at the show with hobbyists exhibiting English bred koi that they've bought from commercial koi farms (Cuttlebrook, and Koi UK), and some competitive awards won at the overall size level by koi bred by hobbyists at home, 'home breds'… I am the first person to have won a major award at the show with a home bred koi. The show weekend was so busy. Apart from the actual show itself, we also harvested the top fry pond outside - a couple of drags, and we pulled up another 12k or so fry. That leaves the harvest at an estimated 50k fry at 1 inch. I reckon around 35k from the bottom pond, and 17k from the top pond. It's just an estimate - based on the number of pan nets worth of fry we harvested. The estimate is probably within +/- 5k . And then, on the Sunday morning - before going to the show that day I needed to clean the filter on the QT. 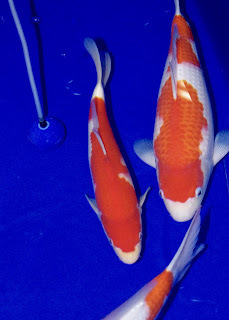 The QT at the time housed a few koi I brought back from my trip to Yume, and there had been an unplanned spawning in the tank over the weekend. I moved the fish into their respective males/females tanks - and one of the females was still dropping eggs and was looking particularly stressed. So, i did my first effort at hand stripping the final flurry of eggs off her. Bear in mind, time was really tight and we needed to get to the show ground. the female was very tired; I think she spawned on the thursday or friday nights and to still have eggs in her belly on sunday morning was a problem - much longer and it could be fatal. So, I just got on with the job of stripping the remaining eggs without sedating her and it seems to have worked fine. All in all, it was an eventful weekend.